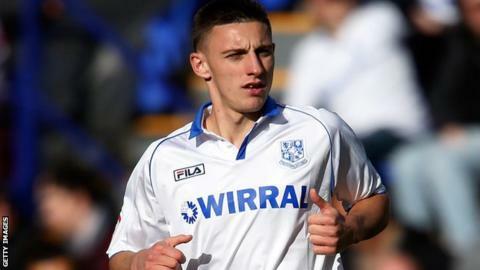 Ronnie Moore wants to keep League One's top scorer Jake Cassidy at Tranmere until the end of the campaign. Wales Under-21 international Cassidy, who has already netted 10 goals this season, is on loan from Championship club Wolves until the end of January. "We'll enquire," Moore told BBC Radio Merseyside. "We spoke to his agent about one or two things. "We'll have to speak to the club and we hope that we can keep him until the end of the season." Cassidy became the first player in the division to reach double figures for the season with the equaliser in at Prenton Park. Moore continued: "He never gives in and he's not afraid to miss. As a striker, if you're afraid to shoot or afraid to miss, you're in trouble. "He just needs to get the right partner alongside him. We have got the right partner [Jean-Louis Akpa Akpro] but he's injured until January. "The chairman has let me bring two in [Jake Jervis and Nathan Eccleston] and hopefully one of those will fit the bill for us." Tranmere's winless run now stands at three matches, but with Crawley and Stevenage also dropping points at home, their lead at the top of League One was extended to two points.